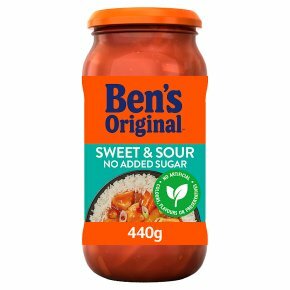 Sweet & Sour sauce with no added sugar. Serves 4. No added sugar. Contains sweetener. No artificial colours, flavours or preservatives. Suitable for vegetarians. Brown 400g of diced chicken breast in a little oil for 3-4 minutes, add sliced peppers and spring onions. Add the contents of the jar, stir and cook for a further 4-5 minutes. Serve with 500g cooked Uncle Ben's® rice or swap to Uncle Ben's® Wholegrain rice.